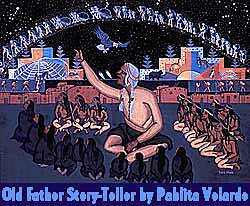 The cover and title page painting -- titled Old Father Storyteller -- may be Pablita Velarde's best known work. The elder is shown telling people of the pueblo stories about the stars and constellations, which march in an arc across the sky. This painting, which Velarde was inspired to by her father's stories, won the Grand Prize at the 1955 Gallup Inter-Tribal Indian Ceremonial. There are 6 stories in the book, each with several of Pablita's fabulous paintings. "Turkey Girl" is the Tewa version of a Zuni storyteller's remak of Cinderella. Turkey girl goes to a dance, and is courted by many men, dressed in the finery her turkeys -- instead of a fairy godmother -- gave her. But when she is found out by her mean stepmother, there's quite a different ending. She doesn't get any of those Indian men, iindeed, they're all chasing her to kill her for a witch! Velarde says in her preface: "I was one of the fortunate children of my generation [she was born in 1918] who were probably the last to hear stories firsthand from Great-grandfather or Grandfather. I treasure that memory, and I have tried to preserve it in this book so that my children as well as other people may have a glimpse of what used to be." Velarde's father was a respected Tewa storyteller in the Santa Clara Pueblo. She and her sisters as children had heard these stories during summer nights when they returned from Indian boarding school to help their father farm his fields. In the late 1950's, when her marriage to Herbert Hardin, a non-Indian policeman, was breaking up, she returned to the Pueblo, recorded her father's stories and translated 6 of the most memorable into English for this book, which her paintings illustrate. The stories are told simply and clearly, as Pablita told them to her own children, and had been told them by her father as a child. At that point in her life she was already an acclaimed arist, with the Bandolier National Monument murals, many prizes, and paintings in museums to her credit. In 1954, the French government had awarded her the Palmes Academiques for her outstanding contributions to art, the first time a European government had recognized Indian art. Dale Stuart King, who had hired her as to paint the accurate -- and artistic -- murals of traditional Pueblo life at Bandelier National Monument, liked the stories and published them in 1960. The book was chosen as one of the best Western books of 1960. Our reprint, 35 years later, uses improved color printing techniques to make Velarde's art available to children and others in highest quality. It's one of our best-selling books. See review, bio, and links to Velarde's murals. Murals in the Indian Pueblo Cultural Center Explained and shown, large and details. Pablita Velarde's is here, and a mural by her daughter, artist Helen Hardin, who died in 1984.